Ofcom is the UK’s communications regulator, covering landline and mobile telecoms, broadband, TV, radio, and on-demand services. Their remit is ensuring that people in the UK get the best from their communications services and that markets work to deliver choice, reliability, and innovative services for consumers. They are keen to release more data openly and see what new insight and innovation will come from that data. Ofcom are already producing a brilliant array of open data – broadband and mobile coverage, technical telecoms data, media literacy, and much more – that is ripe for analysis and development. There is more they would like to do. You can help guide the future release of open datasets or use open data to create a service for consumers or design an app that helps inform consumers so they can make better decisions regarding their telecoms services. 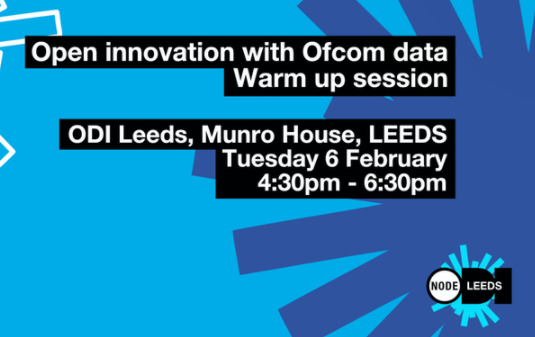 Join us on Tuesday 6 February 2018 at ODI Leeds, Munro House, 4:30pm- 6:30pm for the first open session all about innovating with Ofcom data. The session will be relaxed and everyone’s opinions and questions are valued. Everything will be documented on a shareable Google Doc that we can reference in the future. We do everything in the open so people who can’t attend can still add their input as well. Whatever your interest in media communication, you have valuable ideas and input and we’d love to see you at one of the Ofcom events.